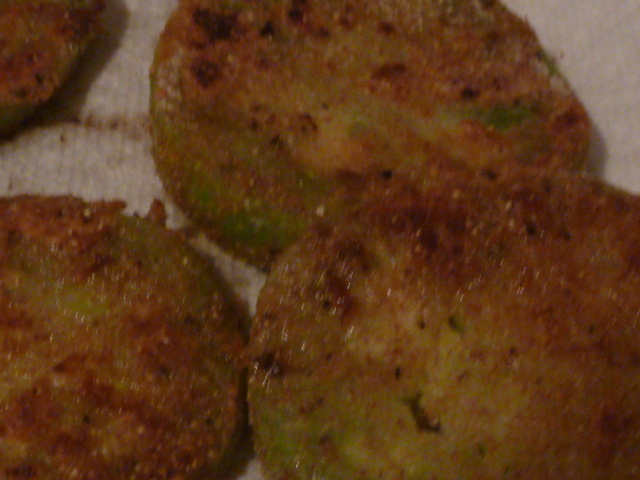 I love fried green tomatoes. So much. For me, they are the ultimate comfort food (well, they’re up there with roasted chicken). I would always pester my mom to make them for me as soon as tomatoes started appearing on the vine when I was younger. When my parents told me they had several green tomatoes I could take, I could not wait to fry up a batch and fantasized about them pretty much all day today. My stomach was rumbling so loud in Torts class I thought the professor was going to hear it (and I sit in the last row in that class!). It was certainly worth the wait, because these were absolutely delectable. They are so amazingly easy, too. I served these with Butter and Balsamic Braised Radishes with Green Beans and some jasmine rice for a full meal. However, they make an excellent appetizer, side dish, or component for a brunch meal, as well. Consider using them to replace an English muffin in some Eggs Benedict or just topping them with a fried egg – yum! I also love them chilled as a snack. Season tomato slices with salt and pepper. Mix together flour, cornmeal, paprika, garlic powder, salt and pepper. Dredge each slice of tomato in beaten egg and then flour and cornmeal mixture. I like a very light crust on my fried green tomatoes, but if you prefer a thicker crust, repeat this process. In a large sauté pan or skillet, heat the canola oil. Fry the tomatoes in batches of 5-6 tomatoes until deep, golden-brown on both sides. This should take roughly 3-5 minutes per side. Drain the cooked tomatoes on a few paper towels. If you’re doing a large batch of these, you can keep them warm in a 200º oven. This is a healthy, easy, scrumptious recipe. Due to the juicy, filling nature of these portobellos, you won’t miss the meat one bit. I served this over jasmine rice as a nice dinner, but it would work equally well as an appetizer. This recipe would work equally well with just about any cheeses or by adding some herbs to the reduction. It’s so great when a dish is packed with flavor and nutrients but low in sodium and fat. Season portobello caps on both sides with garlic powder, salt and pepper. Marinate a minimum of 2-3 hours in stock. Preheat oven to 350º. Spray a large casserole dish with non-stick cooking spray. Place portobellos “gill side” up in casserole dish, reserving marinade. Top with one half of each type of cheese and then tomato slices. Dice remaining tomato slices and set aside. Add about 1 cup of stock to casserole dish and roast, uncovered, in oven for 30 minutes. Meanwhile, in a saucepan, heat Brummel & Brown until melted. Add diced pepper and sauté until golden brown. Add diced tomatoes and reserved stock and simmer, uncovered, until most of liquid has been absorbed. 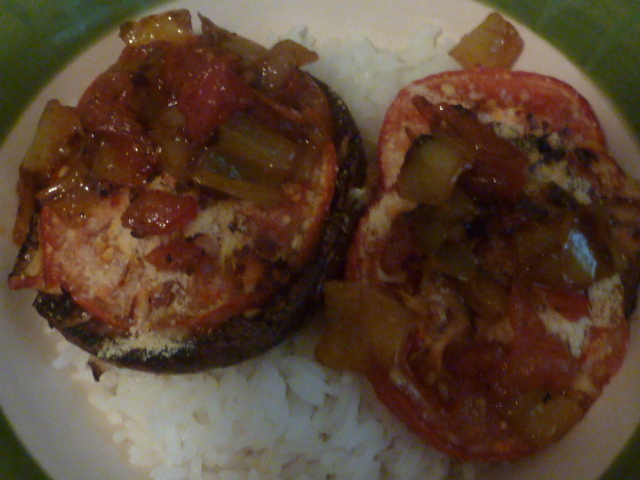 After 30 minutes of roasting portobellos, add remainder of cheese to the top of tomato slices and transfer to broiler. Broil approximately five minutes until cheese is melted, bubbly, and golden brown. Serve, either alone or over rice, topped with tomato and pepper reduction.